Microsoft's flagship ISA Server delivers the Internet to your customers! Written by best-selling author of several MCSE 2000 study guides, this book will provide the system administrators with an in depth understanding of all the critiacl features of Microsoft's flag ship Internet Server. 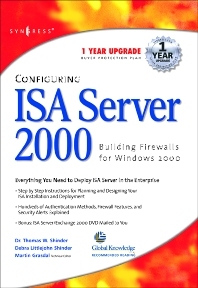 Configuring ISA Server 2000 shows network administrators how to connect a network to the Internet, maintain the connection, and troubleshoot remote users' hardware and software configuration problems.